When I first saw the phrase “Poetry Out Loud,” I didn’t pay much attention. After all, you can live, love, write, dance, exercise, and even work out loud. But one day I was working in the fabulous Poets House (“a national poetry library and literary center”), and I noticed some poems on display. They were by children, and the first one I read was by Allan, a fourth-order at PS1. I’ll bring it in my suitcase, remembrance. “Ever notice how most children proudly make their work visible and most adults don’t?" “She’s right,” I thought, and yet… “Out Loud” doesn’t have to be about acceptance and rejection, or about megaphones and self-promotion. It can be about the pure offering of a gift, one without the expectation of applause. I hope you like it or find it useful. When I use the phrase “working out loud,” I think of the times I listened to someone read a short story, or when I read a book to my young son. “Out Loud” can be the basis for a connection, something that brings people closer, something that makes the work come alive. These are the clearest and most complete guides ever. I improved the flow, completely reworked some of the later weeks, and included more exercises and resources. But I almost didn’t publish them. I was failing to take my own medicine. As much as I encourage people to make their work visible, I was struggling to finish the new guides. I came up with the usual excuses, and months went by. They’re not good enough yet. What if people don’t like them? The key to progress was asking for help from the WOL Community on Facebook. That led to an event yesterday where a few dozen people from around the world walked through the material. The event forced me to publish the drafts, and the comments on the call will make the final version even better. Though the new version isn’t final, it’s ready to use now and I recommend it if you’re about to start a WOL Circle or are in the early stages of one. I’ll incorporate any feedback you have into a new update in early April. Going forward, I anticipate a major upgrade each year and minor changes throughout the year. I hope the new guides, workbooks, and videos can help even more people. 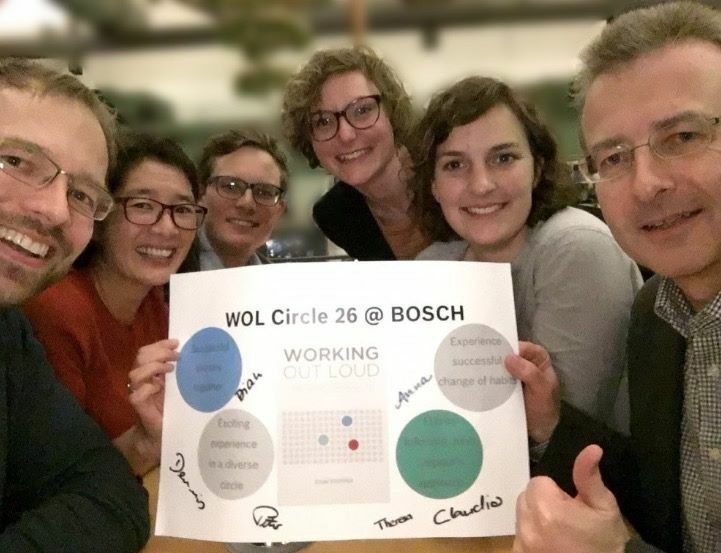 Though there isn’t any marketing of WOL Circles, they’re in over 20 countries and a wide range of organizations. That’s solely because of people like you who read this blog and spread the word, or who “put the cape on” and decided to try something different in their company. The audience laughed. I was at a meeting in San Antonio with people who worked with universities across the United States. Over the course of the day, I heard a wide range of wonderful accents as I met people from Alabama and Alaska, Nebraska and North Dakota, Texas and Tennessee, and pretty much every other state. “Extension provides non-formal education and learning activities to people throughout the country — to farmers and other residents of rural communities as well as to people living in urban areas. It emphasizes taking knowledge gained through research and education and bringing it directly to the people to create positive changes. " Perhaps the most striking thing - even more than their accents or their accomplishments - was their attitude. These were some of the nicest, most caring people I had ever met. Not just a few of them. Literally everyone I met was positive and kind and helpful. Though they’re part of a large organization and all that that can entail, they clearly cared deeply about their work. They all seemed purposeful and committed. Against a backdrop of sameness spreading across America - the same stores, the same bad food, the growing cynicism - here was a chorus of different voices trying to make a difference. It’s a strange thing to say about a conference, but it made me hopeful. Alas, it wasn’t given by me. In fact, I’ve never spoken to the person who delivered it. But I do know she produced some dramatic results. Her name is Vanessa North, and she works in the Australian Tax Office in Adelaide. When she spoke to a group about Working Out Loud, 120% of the audience signed up to join a Working Out Loud circle and put the ideas into practice. A few weeks ago, I wrote about How Change Spreads and how it can begin with a single person who’s willing to try something different. Vanessa is that kind of person. She had participated in a Working Out Loud circle and liked it so much she wanted to form more of them at work. By mid-December, she was ready. I ran a WOL intro session with your slide deck and just asked people to come along and find out what WOL was about (using my existing networks in the Adelaide Tax Office and also a couple of people from other government agencies). 46 people came, a few people couldn’t come but still wanted to sign up, and a few heard about it afterwards. I have some great colleagues helping to co-ordinate and we are having 11 circles with five people in each circle. I’m excited and inspired by the enthusiasm in the groups and how quickly the idea is spreading throughout the office. We have 1800 people in the Adelaide Office so I’m aiming to have them all signed up to a circle by the end of next year. Thanks so much for sharing your enthusiasm, ideas and resources. Of course I was please by her results. But I was even more delighted with her lovely note and her aspirational goal of reaching so many people. When I asked Vanessa if I could blog about her event, she sent the photos below, and we arranged for me to speak with the circles in April to answer questions or just provide encouragement. What’s next? Perhaps she’ll help 55 people think a bit differently. Or maybe together they'll spread circles and help 1,800 people across the Tax Office in Adelaide develop a new habit and mindset. Or maybe they'll do much, much more.